The Ladins have always called it this, from the time when there were a few mud tracks and no ski-lifts. 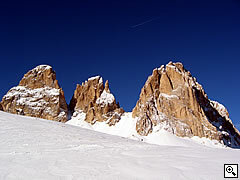 The Sellaronda was the circuit on skis around this massif in the Dolomites (Dolomite mountains), the Sella, across the four passes, which the Ladins used in order to keep in contact with the other inhabitants in the area. Nowadays the name still means the circuit around the Sella massif but it has also come to indicate what amounts to a sort of merry-go-round for skiers, the only one of its kind, a series of ski-lifts and downhill runs, all linked to one another and set against a background of woods, rocky peaks and expanses of snow that is no exaggeration to call extraordinary. The length of the circuit, including both, ski lifts and ski runs, is a little less than 40 km and it is an easy route to ski along. 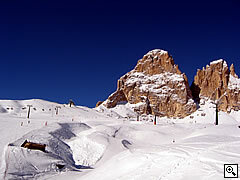 For the Sellaronda ski tour you need the Dolomiti Superski ski pass. But, because it is high up in the mountains, you need to check the weather forecast in order to avoid running into snowfalls or high winds which can turn what is supposed to be an enjoyable day out into an unpleasant and risky enterprise, with the danger of getting stranded. Any skier interested in doing the Sellaronda must be fit, even if the runs themselves are of middling difficulty rather than advances. The time spent on ski lifts is about two hours altogether, without counting the time spent queuing for them or having a break in one of the many refuges dotted along the circuit. Some more instructions: you are advised to start the circuit no later than 10.00 in the morning, although it is a good idea to start even earlier, especially if it is the first time you have tried it. Another word of warning: you must reach the last Pass by 15.30 otherwise you will miss the last ski lifts; they close between 16.00 and 16.30. All of the runs together take about one and a half hours, depending on how good a skier you are. 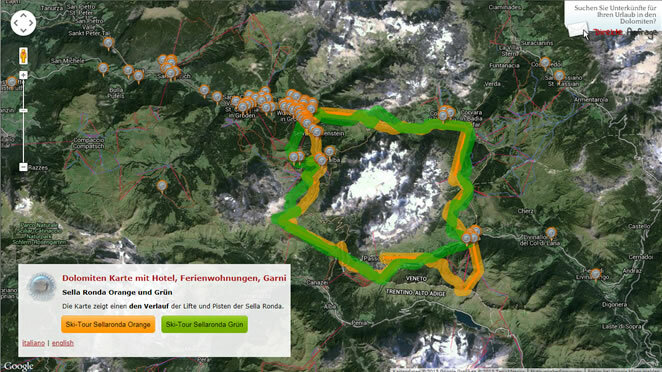 The Sellaronda runs going anticlockwise are marked in green and the clockwise runs are marked in orange. Starting from Selva di Val Gardena: The "Costabella" chair lift and then the "Dantercëpies I & II" cable car take to above the Gardena pass and from here you ski down to the village of Colfosco where the "Borest" cable car brings you to Corvara. 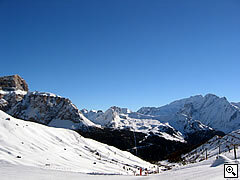 Using the "Boè" cable car and then skiing down, you reach Campolongo pass. 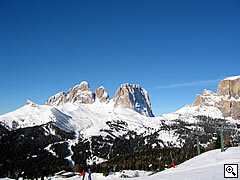 Sella Group, Col Rodella, Sassolungo, Ciampinoi and Selva di Val Gardena. View from the Dantercepies to Alta Badia The chairlift "Campolongo" takes you to Bec de Roces where the run to Arabba starts. At Arabba take the cable car "DMC Europa I und II" to Porta Vescovo and ski down to Ponte de Vauz. 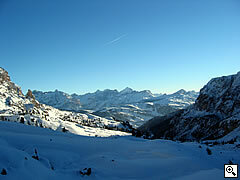 Another two chair-lifts (Fodom – Lezuo and Lezuo – Belvedere ) and you reach Belvedere/Pordoi pass. The ski run takes you down to Pian Frataces (Lupo Bianco) and from here you go up (Cabel car "Pradel - Rodella" and chairlift "Cavazes - Grohmann") to Col Rodella/Passo Sella. A long skirun brings us below the Piz Seteur, who can be reached via chairlift "Sole". 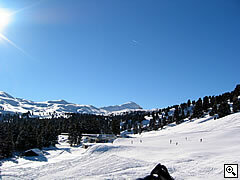 The ski run "Falck" takes you down to the valley station of the "Piz Seteur" chairlift at Plan de Gralba. 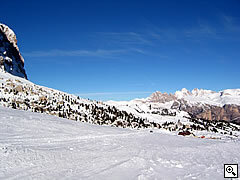 From there you can already see the last ski lift, one has to take to get to Selva di Val Gardena : the ski lift "Senoner". 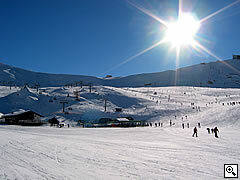 The ski run leads to Selva until the very short chairlift "Fungeia". A SPECIAL TIP: once you get off the top, go down the ski slope and then immediately left, the woods along to "Freina" ski slope, directly to the center of Selva di Val Gardena. You have covered 13.518 metres on ski lifts and you have skied 23.100 metres of ski runs. Total: 36 km and 618 m. Not bad! 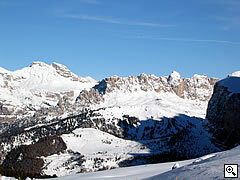 View from the Piz Seteur to the Passo Sella In Selva di Val Gardena you take the Selva – Ciampinoi cable car. The first downhill run nr.5 takes you to the departure point for the Plan de Gralba – new "Piz Seteur I e II" cable car. This takes you up to a short run down to the "Gran Paradiso" chair lift. After crossing the spectacular “Città dei Sassi”, take the Sasso Levante chair lift from Passo Sella and then ski down to Val Salei. View from the Passol Sella to the Belvedere and the Marmolada At the bottom of Val Salei the Pian Frataces (Lupo Bianco) chair-lift leaves and the one that takes you to the Sas Bece refuge starts. At the Belvedere ski down the long run to Arabba. Take the chair lift Bec de Roces and then there is a quick run down to Passo Campolongo. Another chair lift up to Crëp de Mont and then down to Corvara. In Corvara you take a cable car and a chair lifts towards Colfosco, where a comfortable cabin lifts bring you to Malga Cir short above the Gardena pass. From here you take the chair lift Val Setus and you are at 2,280 metres from where you ski down to the Gardena Pass. Here you take another chair lift and you arrive at Dantercëpies where you ski down to Selva di Val Gardena, where you’re started from. You have covered 15.705 metres on ski lifts and you have skied 22.950 metres of ski runs. Total. 38 km and 655 m. What a performance!